Bust monument to F. Dostoyevsky in Tallinn. Estonia, 2002. 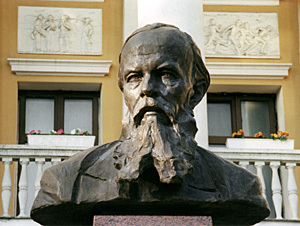 The line of the creative work at the image of F. M. Dostoyevsky and of the theomancy of new facets of his personal genius was not cut short with the design of the monument to the writer for the city of Moscow. Resulting from my participation in the contest, I was offered to perform a bust monument of F. M. Dostoyevsky for the city of Tallinn – as a gift to the Estonian capital from the Moscow city administration. The idea to erect the monument belonged to the Union of Slavic Enlightenment and Charitable Societies of Estonia. I began my work at the studies without wasting any time. Little by little there came to be discerned two main versions: a bust in the classical manner, resembling the upper part of the figure in the design that was meant for Moscow city; and a more strongly dramatized version of the image, that was close in its spirit to the Russian symbolism of the early 20-th century, in which the spatial proportions, the plastic of the bust and of the pedestal were aesthetically close to the value space of the sculptor – a fragment of the spiral-crater. The discussion which was held with the participation of wide public on television, on the radio, in the press, in the Internet with the artistic board of the city, and receiving the approval of the city administration and the construction authorities, determined the decision in favor of the classical version. I am of the opinion that the composition portrait is the supreme form of fine art. While the symbolic character of the work of art determines the compositional space, the rhythm, the proportion of the masses and the form of the whole – as the main, although not the only, means of the artistic rendering of the image, the classical realistic tradition makes an accent on the psychology and the spiritual state of the image – by making use of movement, gesture, and accessories as supporting characteristics. While I was working at the bust of Fyodor Mikhailovich, I did my best to render the state of the writer who was intently looking with his inner sight at the future condition of Russia, into the future condition of the entire humanity. 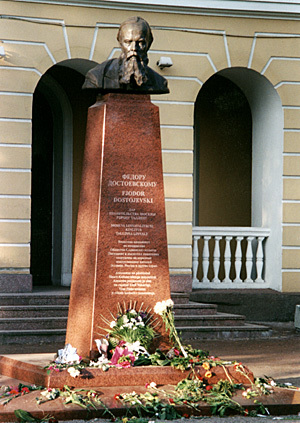 The ceremony to unveil the monument and handing it over to the city of Tallinn as a gift from the Moscow city administration, consecrated by Metropolitan Koprnily of Tallinn and All Estonia, took place May 31, 2002. The monument was unveiled by Tallinn mayor Edgar Savisaar, head of the Moscow city administration delegation Alexander Muzykantskiy and Nikolay Vasilyevich Solovey, the president of the Union of Slavic Enlightenment and Charitable Societies of Estonia.